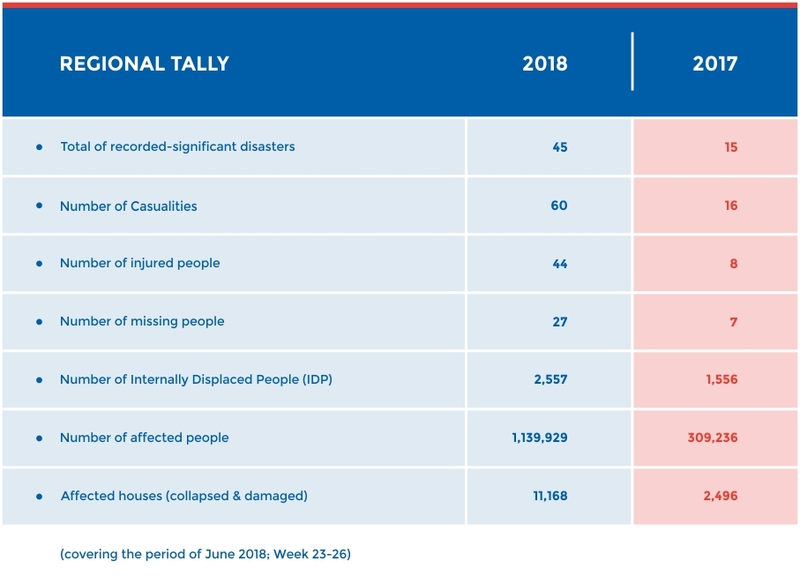 There was a three-fold increase in the number of disasters recorded during June 2018 (45 in total) in comparison to the same time during 2017 (15 disasters). An onset of numerous weather events caused this spike in disasters, with the southwest monsoons, Tropical Depression (TD) Domeng, TD Ewiniar, TD Ester and TS Florita causing floods and landslides throughout the Philippines, Viet Nam and Myanmar. 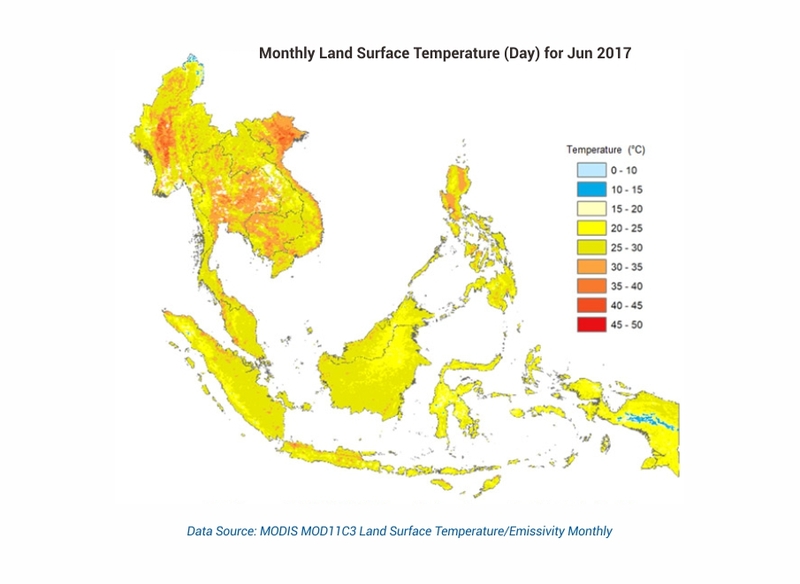 In contrast, several areas south of the equator, particularly Indonesia’s Central Java and Yogyakarta provinces, have experienced the onset of drought conditions, consistent with the shift to the region’s dry season. 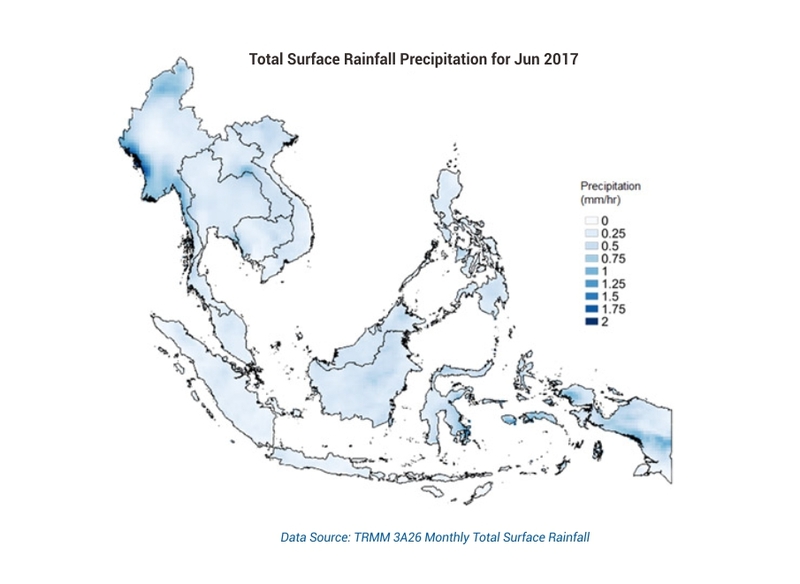 This such phenomena indicates a similar pattern to 2017, which saw northern parts of ASEAN experiencing wet season floods, while southern parts experienced dry season drought events (see Figure 1) . Overall, 20 flood events, 11 storms and 4 wind-related disasters were recorded throughout June 2018. In terms of geological hazards, 26 earthquakes registering ≥ M 4.5 were observed across Indonesia and the Philippines. 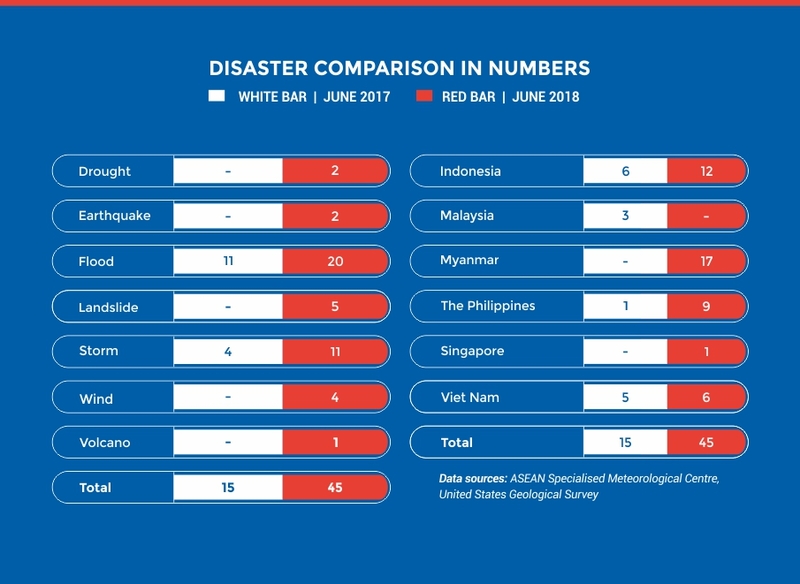 However, only two were strong enough to cause property damage (East Java and Papua provinces of Indonesia, on the 13th and 15th of June respectively. Towards the end of June 2018, concerns were raised due to increased activity reported on Bali’s Mount Agung, which released ash plumes and resulted in a strombolian-type eruption. According to the ASEAN Specialised Meteorological Centre (ASMC), most parts of the ASEAN region will continue to experience wet weather, as the rain band associated with Typhoon Prapiroon affects the region. Hotspot activities have remained subdued, but isolated events have been detected in Viet Nam and Lao PDR. During the first week of July, dry weather is expected to affect Java, and may exacerbate the ongoing drought events. Aside from such southern areas, wet weather is likely to persist over other parts of the ASEAN region. For tropical cyclone (TC) forecasts, the Philippine Atmospheric. Geophysical and Astronomical Services Administration (PAGASA) expects that 10-14 TCs will form and enter the Philippine Area of Responsibility throughout the six months between July and December 2018. Close and continuous monitoring is still required for Mount Sinabung (Alert Level IV) and Mount Agung (Alert Level III) in Indonesia, particularly due to historic Mount Agung eruptions, which lasted up to one year during 1963-1964.